How will Divyabodhanam help us? How are the classes conducted? How to write 'Summary' ? Achen’s Home Parish is St. Peter’s Orthodox Church, Kizhavalloor. H.G. Philipos Mar Eusabius ordained him as Deacon in 1994 and H.G. Thomas Mar Athanasius ordained him to the Holy Priesthood (Kashisho) on January 23, 1997. Fr. Alex K. Joy completed his B.A degree in English Literature from Catholicate College, Pathanamthitta. Achen received his diploma of Graduate in Sacred Theology (GST) and Bachelors in Divinity (B.D) from The Orthodox Theological Seminary, Kottayam. Achen also received his Master of Theology Degree (MTh) with second rank from The Paurasthya Vidyapitham, Pontifical Oriental Institute of Religious Studies, St. Thomas Apostolic Seminary, Vadavathoor and is currently working on his Doctoral degree in Liturgy. Achen has received his Proficiency Certificate in Liturgical Music (PCLM) and certification for Counselling and Addiction Therapies approved by the Christian Medical Association of India. Fr. Alex K. Joy’s, Co-Eccliciastical activities include participation and leadership of a Gospel Team that has a number of Audio and Video Cassettes that have been shaped through Achen’s dedicated effort. In addition to this Achen has written a lot of OVBS songs. Achen has been involved in the Church Choir as a member and Trainer. Achen has been a Counselor and Trainer of the Diocese that looks in to the needs of people with slightly unbalanced family relationships and has also been actively involved in a De-addiction Centre run by the Diocese. 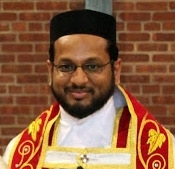 While in India Achen was Director of Liturgical Music School under Thumpamon Diocese and also served as the Private Secretary of late H.G. 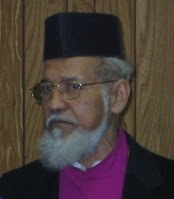 Dr. Paulose Mar Gregorios, the Indian born, World famous Theologian and former President of the World Council of Churches and Metropolitan of Delhi Diocese.